One of the great attractions of Europe is its rich cultural history. The astonishing number of Christian churches, found in villages, towns and cities alike are an integral part of this cultural history. Wandering into these spiritual domains – along with all the other tourists visiting from around the world – I am struck by the peace, spaciousness, beauty and history in small and large churches alike. 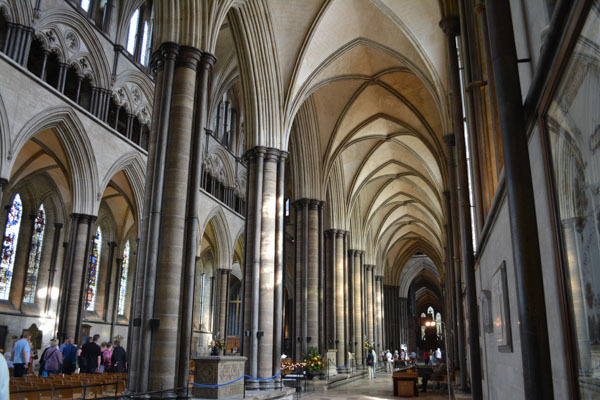 The spacious splendour of Salisbury Cathedral evokes awe and a deep peace. Looking at the many images of Mary, Jesus and various saints, I am reminded of my Christian childhood and early youth and find myself responding to the power of these images. What I have so far seen, in England and France, have been predominantly images of peace, nurturing, friendly socialising over meals or gatherings for teachings and, of course, the never absent cross of death. 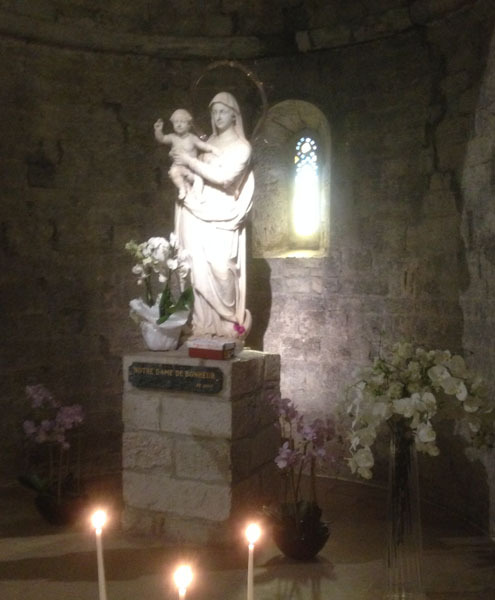 Mary holding baby Jesus inside small medieval church at Castellan, Provence. The flowers and candles are universal symbols of the inner flowering of an opening heart, growing awareness and generous giving of that which is beautiful and life supporting. Mary’s halo in the above statue symbolises wholeness and the unbroken continuity of the truth of the interdependence of all phenomena, as does the circular mandala in the window behind her and in so many of the designs seen in churches and their stained glass windows. 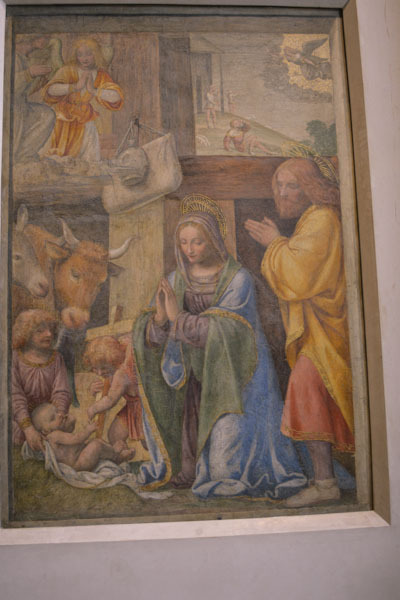 It is easy to see why scenes showing the birth of ‘the saviour’ are so popular for the devotional public and for the many artists and sculptors who offer their interpretations of this key symbol of new life, hope and love. …and, of course, innumerable versions of the nativity scene. What could better represent nurturing? 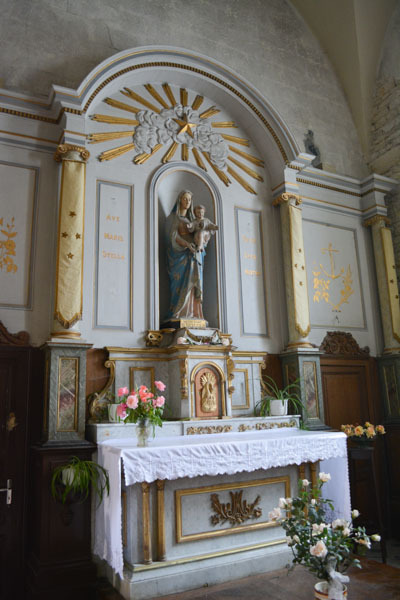 I am struck in France by the preponderance of feminine sculptures and shrines. These figures of feminine gentleness and nurturing of young life have prompted me to consider the similarities and contrasts with the Buddhist images that have been prominent for the last thirty plus years in developing my practice and understanding of Tibetan Buddhist teachings. 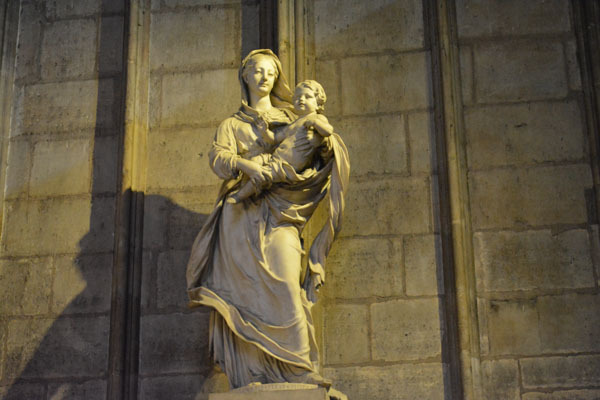 What better symbol of loving kindness than this figure of Mary holding Jesus on the wall of Notre Dame cathedral? 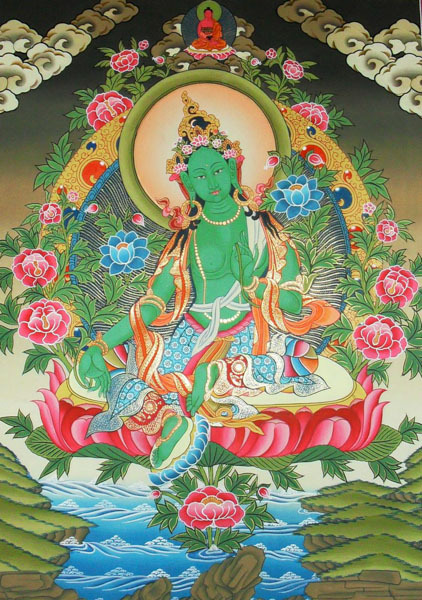 … and on the Tibetan Buddhist hand we have Green and White Tara, both surrounded by flowers – symbols of unfolding awareness and loving kindness. In each case Tara holds a flower in her left hand and her mudra (or gesture) of giving with her right hand symbolises the offering of compassion and healing. Green Tara can be seen as the goddess representing the infinite variety and beauty of nature while White Tara is more explicitly presented as the goddess of healing and compassion. As with Mary, the halo represents wholeness and interdependence. Both the flowing robes of Tara and the loose robes of Mary depict a sense of flowing openness (as opposed to tight clinging) in their general attitude. 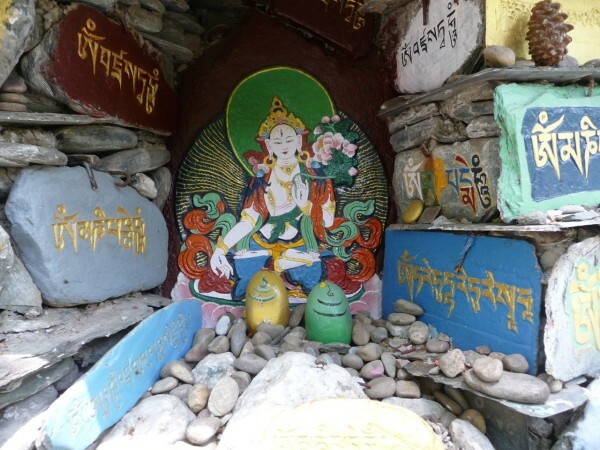 White Tara, goddess of healing and one of the central female figures of compassion, in cave shrine, McLeod Ganj, India. 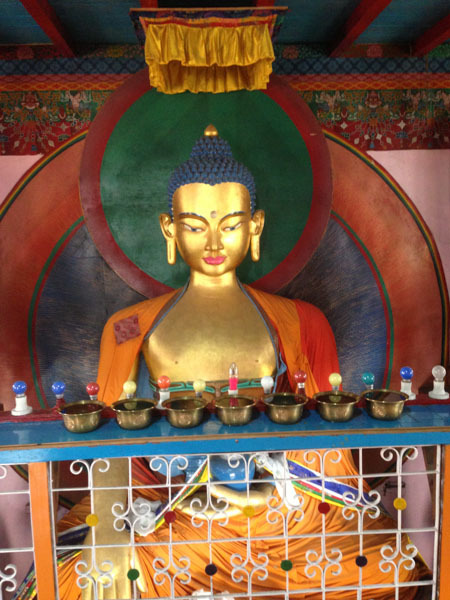 …with the much simpler picture of Medicine Buddha holding a bowl of medicinal elixir to symbolise the giving of spiritual, emotional and physical healing in the Tibetan Buddhist tradition. One depiction of offering to others is elaborate and explicitly social; the other very simple but both prompt reflections on selfless generosity. I have spent much of my adult life wondering why there is such fascination for the cross, with the man Jesus dying on the cross. Why celebrate such a brutal, excruciatingly painful and degrading manner of death? 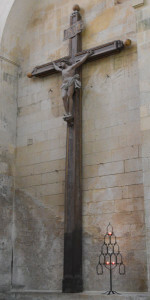 One of the many huge crosses hanging on church walls, this time in the medieval cathedral at Saintes, France. It is only quite recently that I have seen the cross as a symbol of renunciation: A reminder of acceptance and ultimate humility in the sense of giving away all self centredness, attempts to control for one’s own self interest and the instinctive clinging to one’s own life. “My God! My God, why hast thou forsaken me?” squeezed out of Jesus by this instinctive clinging to life but overridden by him as he turns his attention to comforting the accused thief on the cross beside him. Furthermore, the gospels tell us that he knew of his betrayal and imminent death but took no steps to escape. This is indeed renunciation of self. 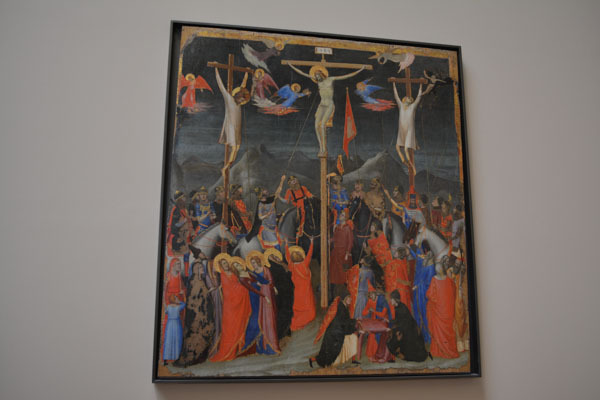 The horrors of crucifixion are graphically depicted in this painting below, displayed in The Louvre. It is just these sorts of paintings that so distressed me as a child, particularly when – as a Roman Catholic – every year in the week or two before Easter and his reported resurrection, we had to follow each step of Christ’s betrayal, sentencing to death, calvary walk carrying the cross and eventual crucifixion. And so I come back to the contemplation of how the power of spiritual images intended to evoke devotion sometimes evoke very different emotions such as fear, revulsion, existential anxiety and confusion. 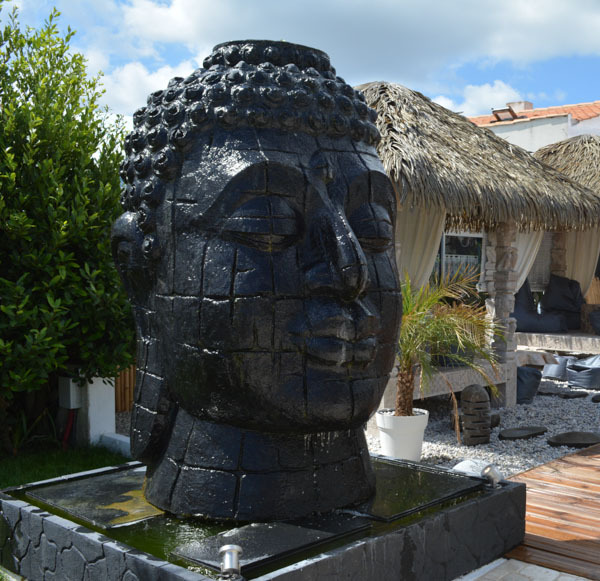 In the Tibetan Buddhist tradition there are peaceful figures to symbolise all the desired positive emotions and also wrathful figures to symbolise the transformation of such negative emotions as fear, anger, hate, jealousy and greed. 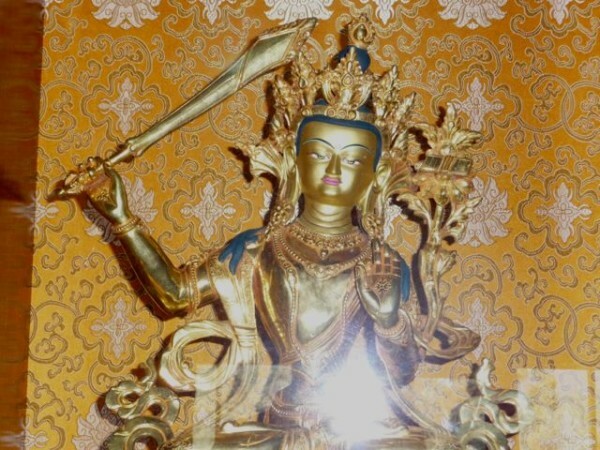 Manjusri, for example, symbolises the wisdom that results from cutting through ignorance and cutting off the destructive emotions and actions termed as ‘sin’ in Christian language. Similarly, Jesus is reported as whipping the money lenders in the temple with similar ferocity and focus. The peace, compassion and wisdom depicted in the Buddha figures currently appearing widely in the Western world, are carrying the same message as this 15th century picture by Bellini, hanging in the Louvre. 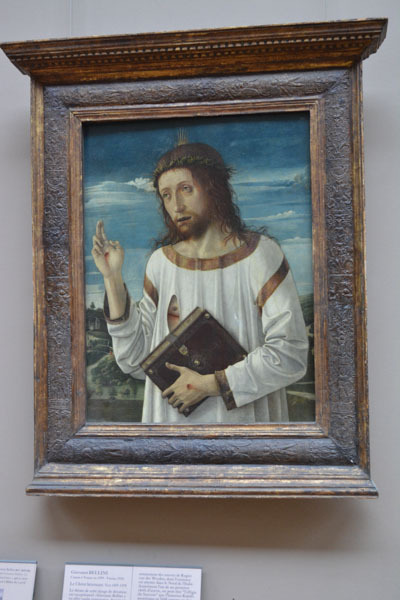 Christ is depicted as a gentle figure – the epitome of humility and material simplicity – but also a teacher of the importance of renunciation and compassion. 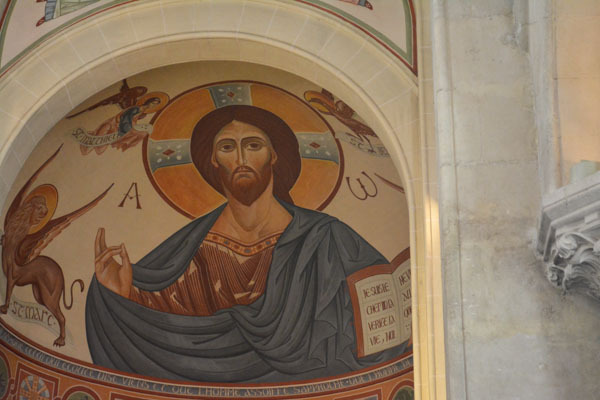 Christ teaching: painting on main dome of church at Sanury-sur-Mer, South of France. 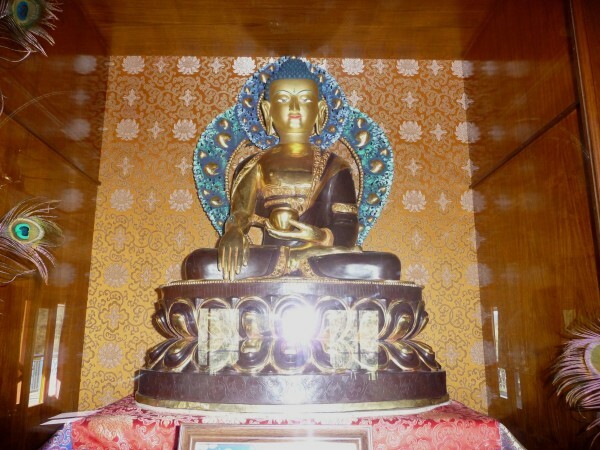 Buddha rupa in small temple in Manali, India. The figure itself is very simply adorned and the image is of peace and wholeness. 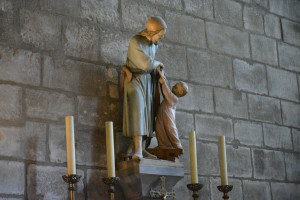 Being reminded, through my travels in Europe, of the depth and importance of Christian imagery and teaching for many hundreds of years in Europe, including the country of my birth, I find myself seeing this imagery with new eyes. Now I can see more similarity than difference in the meanings and the emotions evoked by Christian images when I see them with the eyes that have explored and reflected deeply on the Tibetan Buddhist teachings and images that, on the surface, appear so different. 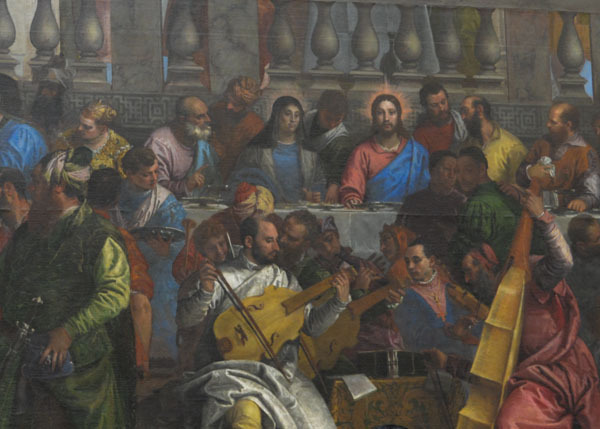 These thoughts have been evoked even before I get to Italy – where I am sure I will be able to continue contemplating the meanings of Christian symbology shown in the abundance of spiritual art in churches, public buildings and the community at large.